People who travel to Europe, whether independently or to join an organized tour, need to buy a plane ticket if they don’t have time for an ocean cruise. In this post, I call your attention to a little know factor that can impact the price you’ll pay for your airline ticket. If you’re like me, you’ll do some research using an internet search engine before clicking the “purchase” button. You reason that careful research might help you save some money but, if you’re like me, price won’t be your only criterion. If you haven’t travelled to Europe for a while, you’ll immediately notice that flights to Europe are a good deal more expensive than they used to be. So on with the research. The amount of time you spend connected to the internet will depend on how thorough you want or need to be. You can get a ticket quickly if you’re willing to accept the first flight you see. I’ve discovered, somewhat surprisingly, that after a half hour of painstaking investigation I often return to that first ticket. But this will be the topic of a later, more philosophical, post. You begin by considering the wide array of flights available on your planned dates of departure and return. If you’re flying independently, you investigate the effect on price of slightly modifying your departure and/or return dates. Consider travelling on a Wednesday or Thursday and not on weekends. Unless you live on the east coast, you’ll probably discover that there is no nonstop flight, or perhaps even a direct flight from your home town in the U.S. to your destination city in Europe. For example, someone flying from Cincinnati (CVG) to Rome(FCO) must, in the off-season at least, choose between flights having intermediate stops in Atlanta, Philadelphia, Detroit, JFK or Newark. Your choice of intermediate stop will impact the total air miles you fly. If you travel often, you’ll probably pay closer attention to total travel time which, in turn, is influenced importantly by your choice of intermediate stop. Not all airports offer the same amenities to international travellers. All else being equal, for example, I’d prefer passing a two-hour layover in Atlanta (ATL) than New York (JFK). The opinion I’m offering here is based on my overall impression of decor, amount of time to pass thru security, the number and kinds of eating opportunities (real restaurants on down to the modern equivalent to hotdog stands), seating, and access to current and wi-fi for my computer. Factors like these become more important as the duration of the layover increases. Clearly, not all of them are equally important. For example, people not enslaved by technology need not consider the availability of wall plugs and wi-fi. More important than the amenties just mentioned is layover duration, which is probably second in importance only to price when selecting your flight. It’s not simply a question of how long you’ll be stuck watching CNN in the your flight’s departure area, or how entertaining you find it to watch people jockey for the seats closest to the embarcation door. 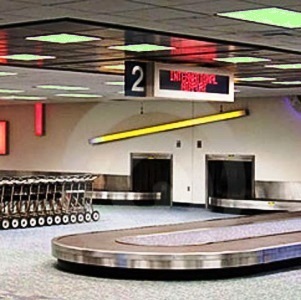 Layover duration is important because of its impact on baggage handling and delivery. The shorter the duration of your layover, the more likely it is that you and your bags will arrive on the same plane. The emotional and financial impact of l osing your bags on an international flight runs the gamut from “inconvenience mixed with irritation” to “minor tragedy” depending on your temperament and circumstances. I have no statistics or numbers on hand, but will try to cycle back to this post and to add some specific information later. However, I’m pretty convinced from personal experience that too short a layover on an international flight is a recipe for disaster. Let’s take a specific example. In my opinion, a layover of 1 hour 20 min is too short for most international flights passing through Atlanta (ATL). I recommend that someone flying from Birmingham (BHM) to Rome (FCO) avoid booking a flight to Rome via ATL if it has a layover of less than 1 hour 45 min. I base this observation on the great many times over the years that I have flown between FCO and BHM. The ill effects of losing your bags will depend in part on whether you are coming or going. Let me explain. For a BHM resident flying to FCO for a two-week vacation in Italy, the non-arrival of baggage is the beginning of a cross-cultural adventure that, while interesting after the fact, can be unpleasant and unnerving while it is being lived. Losing baggage is a fairly common occurrence at FCO because four different firms are involved in some phase of baggage handling. As a result, the people at the lost baggage office at FCO are experienced in dealing with distraught travellers. Many of them have learned how to calm the nerves of weary travellers with a smile or a kind word. You’ll be given a receipt with a claim number. The clerk won’t be able to tell you precisely when your bags will arrive or even offer a guaranteed “at least by” date. Be sure she or he gives you a local number to call for status updates. And be sure to ask what are the hours during which you can call (and on what holidays the relevant office will be closed.) And, finally, if you have flown in on Alitalia, begin praying fervently that it hasn’t gone bankrupt before you get your bags. The influence of layover duration is different for the return flight. If you are returning from Rome (FCO) to BHM via Atlanta (ATL) you need to pass through passport control, clear customs, recheck you bags (if Atlanta is not your final destination) before locating the departure gate for your connecting flight to BHM. Passport control in ATL takes anywhere from 10 to 50 min. If it’s on the long side, you have less time for the other steps before you begin hiking to your BHM departure gate. All this can be a challenge for weary travellers, but you can do it! The question is: how much anxiety will it provoke? If you purchased a ticket with too short layover in ATL, you’ll miss your connecting flight to BHM if one or more of the various “steps” mentioned earlier gets prolonged. The good news here, however, is that they’ll simply put you on the next flight to BHM (a wait of 1 hr 30 min to 4 hours depending on day and time) and you’ll simply home a bit later than planned. In regards the return trip, then, there is a fairly straightforward tradeoff between a relatively long layover with a well-specified wait for the connecting flight and a shorter layover with the possibility of a much longer wait. It’s your call. If you’re going to gamble on a short layover, I’d recommend doing so on the return flight to the US rather than on your original flight to Europe. The ill effects of losing your bags when flying to Italy for a 2-week vacation is far more serious than not getting your bags, or needing to take the next connecting flight in the US. Trust me, you don’t even want to consider the possibility of buying a replacement wardrobe in Rome! Now we can finally get to the topic of this post, namely the price you’ll pay for your ticket. What I’m about to say should be regarded as a hypothesis and not a statement of demonstrated fact. I have had the experience multiple times over the past several years of researching an international flight only to discover that when finally decide to buy a particular ticket its price is higher than when I originally saw it. The price changes I have noted are relatively small, in the $50 to $70 range. This is small change in comparison to the price differential between the most and least expensive tickets available, and so I’ve simply shrugged off the last minute price increases. However, my experience has been consistent enough to lead me to think that this is an unfair sales strategy we need to combat. Many factors impact the price of a seat on international flights, not the least of which is seat availability. Airlines won’t fly if they can’t fill most of the seats. If you’ve compared what you paid for a flight with what your fellow passengers have paid you already know that prices vary. There is no fixed price for a given seat on a given flight. Today you don’t buy a seat on an international flight, you bid on it. I think the airlines calculate your degree of interest on a particular flight by, roughly speaking, counting the clicks. And if you’ve clicked often on one particular flight, the airlines conclude that you really want it and will pay to get it. If I’m right, how do we respond? First, we need to decide if my working hypothesis is correct. Do you have evidence or information that supports or disconfirms it? In the meantime, I’ve decided on a strategy to use the next time I fly between Europe and the U.S. I have two computers connected to the internet here at home. I plan to use one to do my flight research and the other, which has a different IP address, to buy the ticket I eventually select. This entry was posted in Flights & hotels and tagged air travel, cheap tickets to Europe, connecting flights, flight to Rome, intermediate stops, layover duration, nonstop flight, travel to Europe. Bookmark the permalink.